We thought it was interesting to feature one of the finest modernist buildings that was ever created in Europe. The building's name was Evoluon and was located in the city of Eindhoven in the Netherlands. 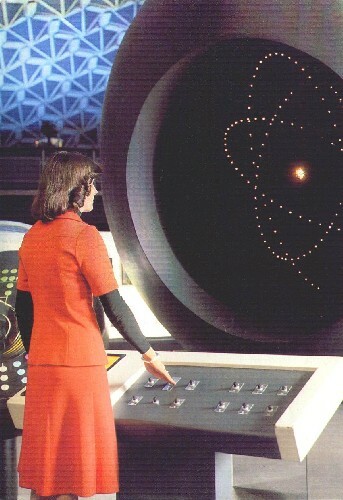 It housed a "Logan's Run" type public exhibit of the wonders of technology. Very space age. A similar concept to the Atomium that they build in Brussels in 1958. I remember my parents took me there when I was about 8 years old. It left an incredible inpact on me. Unfortunately the Evoluon exhibit inside the building was closed down in 1989. Yet, the building itself still stands, although in altered form. To celebrate the 75th birthday of the Philips company in Eindhoven in 1966, a special exhibit on science and technology was opened in the Evoluon, a futuristic building designed by L. Ch. Kalff. It was built for this purpose on a piece of land at a prime location, a triangular terrain at the crossing of three main roads, donated by the city of Eindhoven. The Evoluon was an idea of Frits Philips himself, a very idealistic man who wanted to give the people a beautiful and educational gift to celebrate the birthday of the company that bears his name. 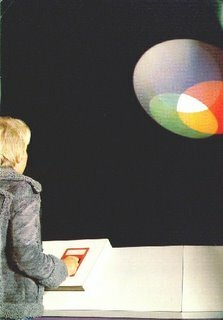 The exhibition was designed by the British designer James Gardner. It was not a display of Philips products, but a museum with a message. Shown was how mechanisation and automating had increased production and made life more comfortable. You could see how modern society had its problems, from environmental pollution, depletion of natural resources to over population, but also how technology could offer solutions to these problems. Lots of science and its technical application could be seen. The computer was an early part of the exhibition. Very special was that the visitor was encouraged to touch everything and try things to see how they worked. The building could hold 1500 visitors, and later 2000. Many technically minded people have found the path to their later hobby or profession by visiting this wonderful exhibition. James Gardner (1908-1995) was the most important British post-war museum- and exhibiton-designer. Many important events of British government and large firms were designed by him. 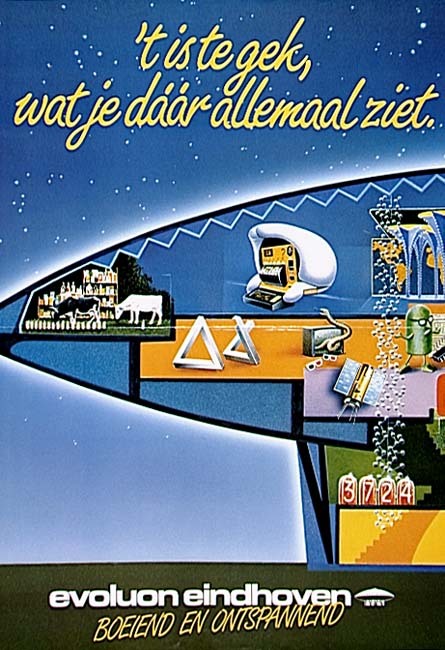 He did not only design the Evoluon exhibition of 1966, but also the additions of 1985. The designer, L. Ch. Kalff, was the artistic director of Philips at the time. 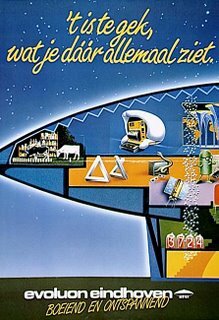 He also designed the look of appliances like radios, and designed the well-known Philips brand image. Another unique building he designed is the dr. A. F. Philips observatorium. For the Evoluon he was assisted by architect L. L. C. de Bever, who had just graduated, the Evoluon was his first big project. Designer Kalff decided how he wanted things to look, and architect De Bever took care of the technical stuff and put the drawings to paper. 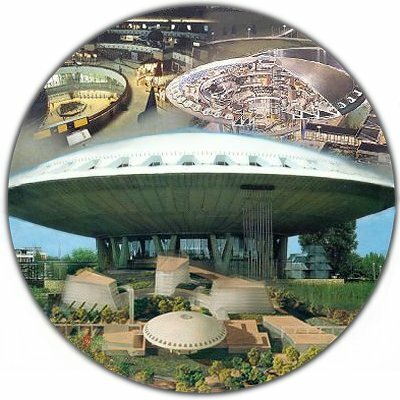 The N. V. Hollandse Beton Maatschappij from Den Haag was consulted for the construction possibilities, did the calculations and built the Evoluon. For the calculations there was a lot of assistance from the T.N.O. Delft. For the Evoluon a triangular piece of land of about 5.8 ha. was available. Three busy main roads surround it. Because the building would be visible to all this traffic, a round form was chosen. It was to be a new landmark for the city, that was to arouse curiosity and associations with modern technology and space travel. The dome has a diameter of 77 m. and rests on 12 V-shaped columns. There is a round pond of about the same size in front of it, and a large parking lot. In the dome there are three concentric walkabouts, about 10 m. wide, with a total size of 4700 sq.m. Next to the dome is a radar tower with a height of 60 m. and a diameter of 3 m. West of the dome is the service building with a restaurant, toilets etc. In the cellar of this building was another exhibition and a small movie theatre. In 1994 a large building was put up in front of the evoluon that has an auditorium and movie theatre that can hold 440 persons. Today the Evoluon building complex is used as a high class business conference centre. It is still busy in there, but there is nothing to see for the general public anymore.